Native (AOT) Compilation (IL2CPP) to enjoy the performance of C++ by writing code in C# instead, this would eventually bypass JIT entirely which ofcourse has some trade offs but the main objective here is performance and efficiency while maintaining proper functionality. 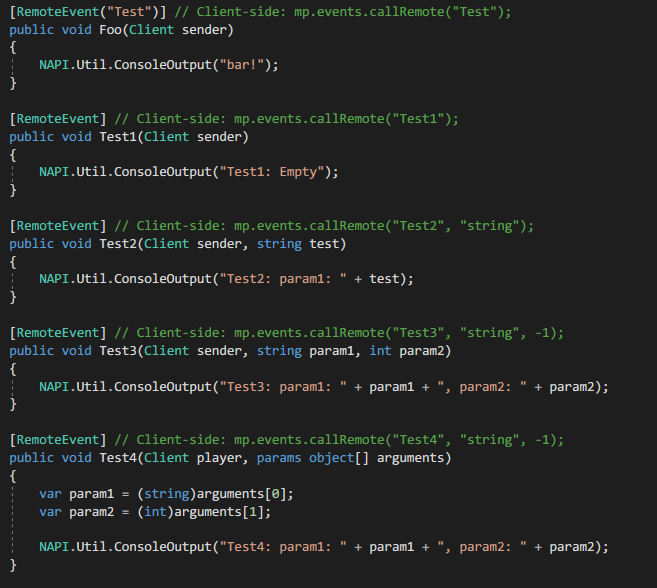 Implementing missing functionalities that was functional before the bridge. Automated testing (incl. regression checks) to ensure proper API functionality with framework updates. Getting rid of dependencies as much as possible (Linux). Make use of the latest C# features (7.0+). Fixes: Resolved runtime assembly issues, bridge should be fully standalone. Fixes: The bridge now has its own Newtonsoft.Json to avoid version conflicts with the user-loaded (newer/older) assembly. Fixes: Dynamic type no longer relies on an older Microsoft.CSharp.dll assembly which was a workaround. Important: Bridge's framework update now targets netcoreapp2.1, make sure to set your target framework to .NET Core 2.1 in your projects for the resource to function properly, this framework update brings a lot of performance improvements over .NET Core 2.0 as well as the missing features for EF Core importantly. Updated: Overall bridge performance improvements and optimizations. most evidently, ClientEvent Triggers now perform atleast 2 times faster than they did before. Removed: The unable to locate .NET Core SDK message, the bridge is self-contained and does not require any SDKs to be installed. Added: Disabling default server behaviour event attributes: [DisableDefaultChat], [DisableDefaultOnConnectSpawn] and [DisableDefaultOnDeathRespawn], example of usages can be seen, as following on OnChatMessage, OnPlayerDeath and OnPlayerConnected. Fixed: Cast exceptions and other bugs reported by users. Important: A new .NET hosting method for the bridge which means an obnoxiously screamingly loud "LINUX SUPPORT!" for the bridge, so you can now use your cheap a$$ virtual private servers. Updated: Performance improvements of events, remote events and commands.. it's basically the stuff that programmers love seeing, if you're not impressed.. get out of here!! Added: FirstChanceException Event that should catch all the exceptions thrown before being handled. Added: UnhandledException Event that should catch all the unhandled exceptions thrown. Fixed: StackOverflow exception due to events when no resources are loaded. Fixed: Deleted props should now be synced on player connection. NOTE: Make sure your event method modifier is set to public!!! Added: NAPI.Server.SetAutoRespawnAfterDeath(bool value) -- disables the default auto respawning after death, default value: true. 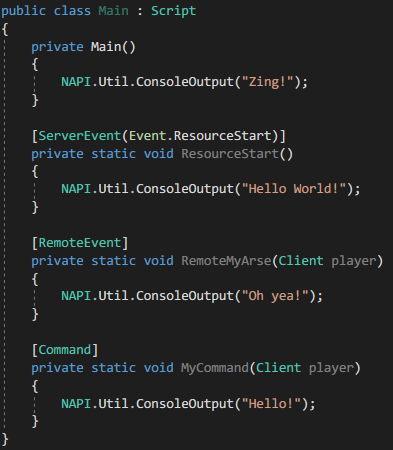 Added: NAPI.Server.SetAutoSpawnOnConnect(bool value) -- disables the default auto spawn on player connection, default value: true. Added: NAPI.Server.SetGlobalServerChat(bool value) -- disables the default server chat, default value: true. Added: Non thread-safe methods will no longer cause a server crash when called outside of main thread, will simply print a warning on console. Fixed: CreateVehicle should now spawn with desired colors set in the parameters. Added: Exceptions are now logged into their own file (server_exceptions.txt), so now you can worry not about the console crashing without you having a look at the thrown exception. Added: Additionally, we've added Ben.Dymestifier which should make exception (stack traces) logs more productive. Fixed: ConstantVehicleData was not functional thus not reading from vehicleData.json correctly, a lot of vehicle related methods were not functional. Fixed: Explosions should no longer crash the server. NOTE: API. is now considered obsolete and under-performing, meaning that it will no longer receive changes, its only purpose is backwards compatibility with older resources, use NAPI. instead for newer resources. Added: Exported to NAPI, it was missing. Added: User informing of bridge initialisation failure when core assemblies are missing. Fixed: ReflectionTypeLoadException should now output the LoaderExceptions for debugging purposes, a message to inform the user of possible causes was also added, which should inform you of missing assemblies. Fixed: ReflectionTypeLoadException when loading modular compiled resources that depend on other dlls, caused by the fact that compiled resource dll was loaded into memory thus loosing directory access for loading the required modules. as a result, shadowcopy attribute removal was reverted and the resource will no longer be loaded into memory before being used but instead, it will be loaded from the directory imposing a file lock on the resource dll and its modules. Fixed: Server crash when an entity type was not initialised in the entity pool, throwing missing key in dictionary exception when using NAPI.Pools.GetAll(Type) while it's empty. Fixed: Exported functions and events were fixed, should no longer throw an exception. Fixed: CreateObject should no longer spawn invisible objects. Changed: compiled resources are now loaded into memory (shadowcopied) and can now be reloaded on the fly, therefor shadowcopy attribute in meta.xml is now deprecated. Changed: NETCoreApp 2.0.3 dependency is now no longer required. Added: Graceful server shutdown that should invoke the OnResourceStop event on running resources and kick all connected players before shutting down. Changed: Fix critical assembly loading issue, if reference is not found in resources/(resourceName) folder, it will be loaded from runtime/ folder, otherwise it will error out. Changed: Minimal improvements to exception handling. Added: Added CancelEventArgs Spawn property for OnPlayerConnected, to cancel auto-spawn. Added: A new clean and organised API that can be accessed via NAPI. Changed: Events are now in their own derived class, can be accessed via Event. instead of API. Changed: Compiler now shows error message, filename and error line on resource compile error. Added: GlobalDimension constant, this replaces the 0 dimension known as the global dimension seen by everyone in GTAN. Added: SpawnPlayer, self explanatory, it spawns the player. very useful for those who want to override the default respawning. Added: OnPlayerConnect event - invoked on connection initialisation, also has a cancel token which kicks the player out. Changed: OnPlayerConnected event - invoked after connection initialisation, also has a cancel token which kicks the player out. Changed: OnPlayerDeath event now has a cancel arg that overrides the default ped respawn on death, by default it is set to false, thus respawning the player after death. 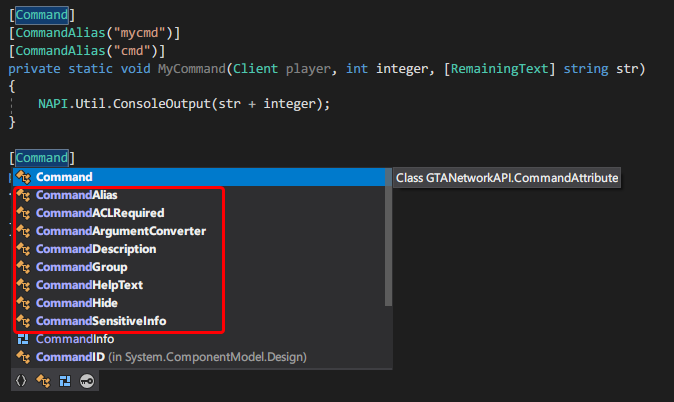 Changed: OOP Methods/Properties for the stated methods above were also updated. This page was last modified on 9 July 2018, at 18:33.